1. Homemade Valentine’s Day Cards: I am so excited to start an annual tradition of making each other Valentine’s day cards this year. We can build on this activity with new materials as she grows! 2. Arts + Crafts Activity: Adina is into anything and everything sensory right now! She loves touching different textures and even sniffing and licking them (I have to watch her like a hawk!) I have come across some great activities online like this sensory bin project and this heart craft project and plan to do them with Adina. 3. Valentine’s Day Playdate: I try to host or attend a playdate with Adina at least once a week, especially during the cold winter months. In honor of V-day, why not make our weekly playdate extra special and invite everyone to come dressed in their most festive attire? Each parent and child can bring a potluck dish to share with the group and the children can make each other valentines from one of the activities above. I found this adorable red lace dress for Adina and knew it would be perfect for Valentine’s Day. As you know, I can’t resist the chance to match our outfits so I wore this red scalloped skirt on our recent Galentine’s Day outing. My favorite part is that this skirt has pockets! We finished the look with matching red bows - one for me and one for her. These looks would be perfect for a Valentine’s Day playdate party! 4. Make a Valentine's Day Treat: If you like to bake, this is the great idea to do with kids for Valentine’s Day! I’m not a natural baker, but I sure do love a good box mix! Just add a heart shaped cookie cutter and some red and pink sprinkles for that special “made with love” touch. If you want to stick with something healthier, with a little bit of planning and lots of fruits and veggies, you can provide healthy Valentine’s Day snacks that will still hit the sweet spot! 5. Family Date: Valentine’s Day is not just for couples, so get the whole family involved! Since it falls on a weekday this year, we’ll plan something fun to do as a family over the weekend. 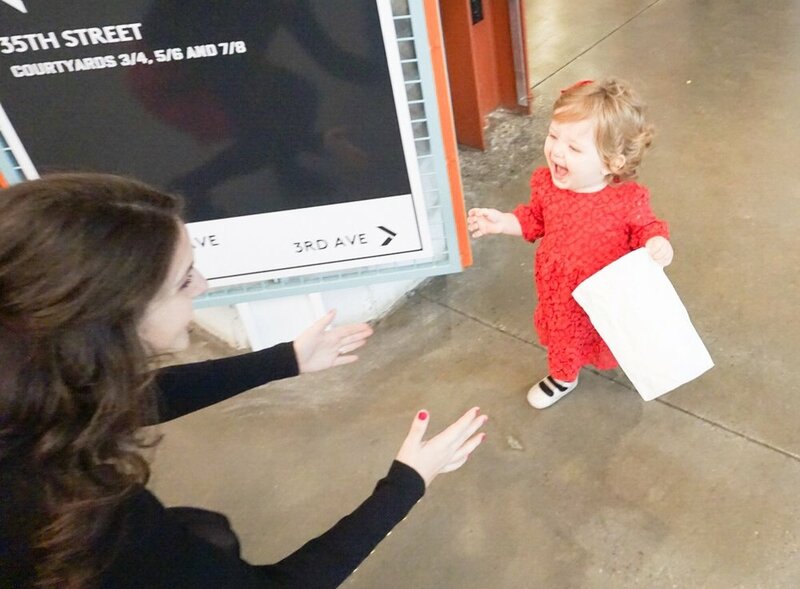 I’m thinking about walking by Brooklyn Bridge Park and taking Adina to Jane’s Carousel in Dumbo so she can ride the merry-go-round for the first time! Adina is still too young to know (or care) about Valentine’s Day - she just wants to, run around, make a mess, and have fun. I hope when she gets older, she’ll remember the memories we made together. I’m sure before I know it, she’ll grow up and have a Valentine and Galentines of her own. At the end of the day, it doesn’t really matter what we do. It’s all about spending time together and creating these special moments that I will surely cherish forever! *Top 3 photographs thanks to Anna McClellan, check out her instagram and facebook page.